Rashad Charjuan Owens has been indicted for one count of capital murder, four counts of felony murder and 24 counts of aggravated assault. Photo courtesy of Austin Police Department. A Travis County grand jury on Monday indicted Rashad Charjuan Owens, the driver charged in the crash during South By Southwest that killed four people and left more than 20 injured. Owens was indicted for one count of capital murder, four counts of felony murder and 24 counts of aggravated assault, according to the district clerk's office. Owens, 21, who has not made a public appearance since his arrest shorty after the wreck, initially faced one count of capital murder and 24 counts of aggravated assault. Police say Owens was driving while intoxicated when he fled police and drove a stolen car through a crowd of people on Red River Street on March 13. Police filed the charge of capital murder after Jamie West, 27, and Steven Craenmehr, 35, died at the scene. Deandre Tatum, 18, and Sandy Le, 26, died in the two weeks following the crash. Owens remains in Travis County Jail with bail set at $5.5 million. His next pretrial hearing is scheduled for June 3. One of the 23 victims injured in the South By Southwest crash is still in critical condition at University Medical Center Brackenridge, according to spokeswoman Kendra Clawson. DeAndre Tatum, 18, was among eight victims transported to UMC Brackenridge after a drunk driver sped through a crowd of people outside The Mohawk during SXSW. Tatum’s condition has not changed since the incident occurred on March 13, Clawson said. Two other victims, Mason Endres, 18, and Evan West, 29, have been moved to in-patient rehabilitation facilities. Joseph McCraney, 26, was released Saturday. After the crash, 35-year-old Steven Craenmehr and 27-year-old Jamie West were pronounced dead at the scene, while a third victim, Sandy Le, died five days later. All other victims have since been released from the hospital. Police have charged 21-year-old Rashad Charjuan Owens with two counts of capital murder. In a press conference the day after the crash, Austin Police Chief Art Acevedo said the department also planned to charge Owens with counts of aggravated assault with a vehicle. No additional charges have been filed. Owens is currently in Travis County Jail, and his bond has been set at $3 million. His first court appearance is scheduled for April 9. Updated (Friday, 7:15 p.m.): Travis County district judges issued a formal arrest warrant Friday afternoon for 21-year old Rashad Charjuan Owens, who has been accused of driving his car through a crowded area of downtown during SXSW activities, killing two people and injuring 23 others. Owens was charged with one count of capital murder and bond has been set at $3 million. The booking photo of Rashad Charjuan Owens, who was formally charged with capital murder Friday afternoon. Courtesy of Austin Police Department. Initially, APD Police Chief Art Acevedo said Owens would be charged with two counts of capital murder, which is a felony, and multiple counts of aggravated assault with a vehicle. So far, no other charges have been filed. According to the police affidavit, Owens attempted to evade police because there were other warrants out for his arrest. The affidavit describes a violent, chaotic crime scene. “Victims were reported to have been flying everywhere as they were being struck by the Honda,” the affidavit said. Updated (Thursday, 8:52 p.m.): Christopher Ziebell, emergency department director of University Medical Center-Brackenridge, said Thursday night that he was concerned about the recovery prospects for the most critically injured victims of the SXSW crash. Seven of the 23 people injured in the crash were taken to the medical center from the scene. An eighth person came to Brackenridge from another hospital after the person's injuries proved more serious than doctors initially realized, Ziebell said. The two individuals who died were 35-year-old Steven Craenmehr and 27-year-old Jamie Ranae West. West's husband, Evan West, is among those who were injured and transported to the hospital. Earlier Thursday afternoon, Reverends Katie Wright and Bob Gribble of St. David’s Episcopal Church hosted a vigil for the crash victims, with about 30 people in attendance. Michelle Marshall, a SXSW attendee from Austin, said she was disturbed by the unexpected crash. In an address, Wright said she hopes the community can reflect on the tragedy, while also appreciate the positive aspects of the festival. Updated (Thursday, 1:40 p.m.): Austin police officials have named 21-year old Rashad Charjuan Owens as the driver who allegedly struck more than 20 individuals, killing two, with his car while speeding down Red River Street at SXSW after midnight on Thursday. Owens was charged with two charges of capital murder by terroristic threat, a felony-level offense, and multiple counts of aggravated assault with a motor vehicle. Owens was processed at Travis County Jail at 5:44 a.m. No bond has been set. 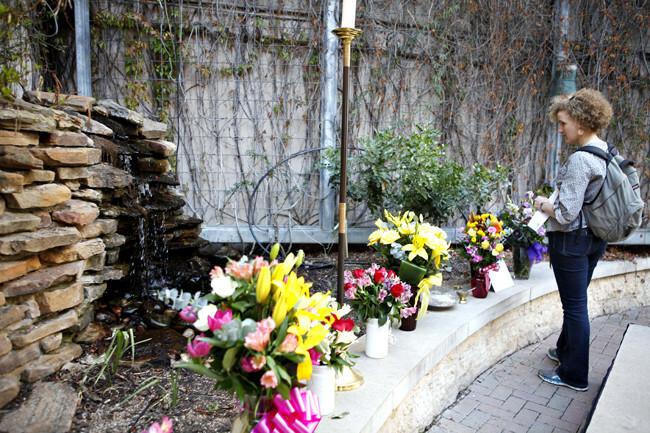 While many SXSW activities will continue, St. David's Episcopal Church at 301 E. Eighth Street will host an open prayer service for the victims at 5:30 p.m. The car incident killed two people and injured 23. One of the victims who died was 35-year-old Steven Craenmehr, a creative director for the international branding and promotion company, MassiveMusic. The identity of the woman who died has not been revealed by the police. The Mohawk, which is located right by where the incident took place, has canceled all of its afternoon events though it has not announced a plan for the evening events. APD will also be closing Eighth and Ninth streets from the I-35 frontage road to Neches Street at 5 p.m, though access to the frontage road will not be affected. International relations sophomore Rush Evans, who was inside The Mohawk at the time of the crash, said the events were barely noticeable from inside the venue. Evans said his view from the balcony allowed him to watch the first responders react to the scene. Evans, who is a native of Austin, said he did not anticipate such a serious incident would happen at the festival. He said he was shaken by his proximity to the crash. Earlier Thursday, Fort Hood soldier Andrew Barmwell filed a police report for a stolen vehicle with the Killeen Police Department, according to Chris Haug, media relations chief at Fort Hood. Haug said Barmwell believes his stolen car, a gray Honda Civic, may be the one used in the crash. Barmwell was not available for comment. Updated (Thursday, 11:50 a.m.): MassiveMusic, an international music branding and promotion company, identified 35-year-old Steven Craenmehr as the man who was killed in the car incident. Craenmehr worked as the creative director for the Amsterdam, Netherlands-based company. "During the eight years that Steven worked for MassiveMusic, we got to know him as an unstoppable force, full of life, love and laughter," the company released in a statement on its website. "This is an irreplaceable loss for the MassiveMusic family and we are grateful for the years we spent with him." 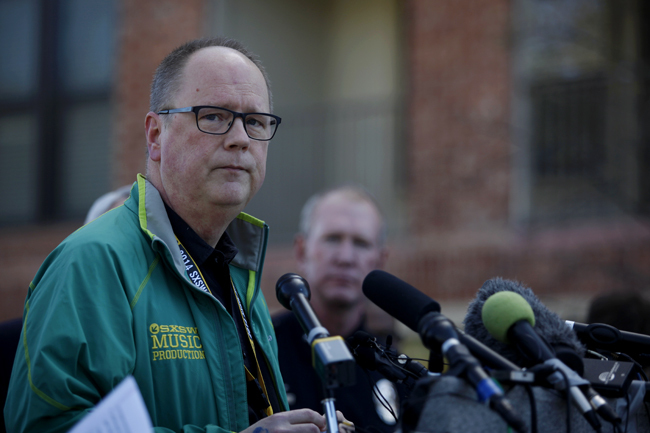 Updated (Thursday, 11:26 a.m.): At a press conference Thursday, SXSW managing director Roland Swenson said SXSW operations would not be affected by the early-morning car crash that resulted in two deaths and more than 20 injured pedestrians. “As much as we would just like to go home and spend time absorbing the shock of this horrific event, we feel our best use is to continue operating today,” Swenson said. APD police chief Art Acevedo said the police originally incorrectly reported the identities of the deceased people. Though the suspected driver struck a man and a woman on a moped, only the woman, who Acevedo said was from Austin, died. “The male driver is actually stable and in good condition,” Acevedo said. A SXSW visitor from the Netherlands whose name has not been released was the other fatality, Acevedo said. The man from the Netherlands was on his bike at the time of the crash. Of the five patients originally reported as being in critical conditions, at least two are still critical, while the other three patients are in surgery or being evaluated, according to James Shamard, chief of staff for Austin-Travis County EMS. Acevedo and other city officials, including Austin Mayor Lee Leffingwell, praised the efficiency of the first responders to the scene. Leffingwell said city officials do everything they can to promote the safety of SXSW attendees. Daytime events will go on as planned, while planners at Mohawk Bar and Cheer Up Charlie’s, where the crash occurred, are still determining the best course of action, Swenson said. Original story: At least two people died and more than 20 were injured after a car ran through the intersection of 9th Street and Red River Street during South By Southwest just past midnight on Thursday, according to the Austin Police Department. The incident took place right outside The Mohawk, a bar and live music venue. At 2:15 a.m., APD reported that it had apprehended the suspect driving the car by tasing the driver. The driver, who has not been publicly identified, struck multiple people, as well as a taxi cab. A man and a woman who were riding a moped were pronounced dead on the scene. In total, there were 23 victims, five of whom were in critical condition. APD Police Chief Art Acevedo said the driver will be charged with two counts of capital murder, as well as 23 counts of aggravated assault with a vehicle. In a joint press conference, Acevedo and Harry Evans, Austin Fire Department chief of staff, said the incident began when an APD officer initiated a traffic stop outside the Shell Gas Station on the intersection of I-35 and 9th streets. The driver weaved through the gas station lot and accelerated against the flow of traffic on 9th Street. When APD officers tried to overtake the vehicle, the driver took a right turn down Red River Street at a “high rate of speed,” Acevedo said. 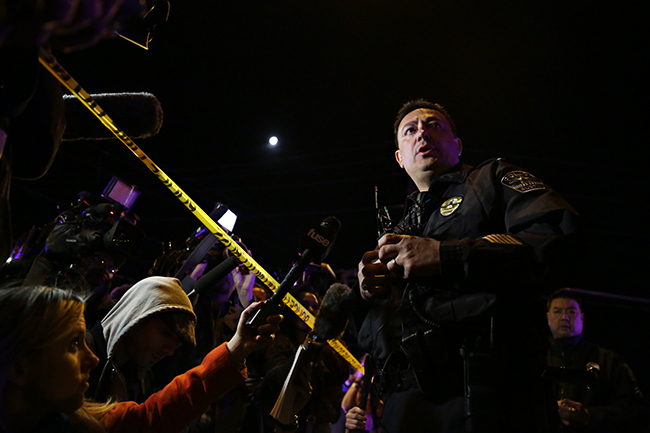 ​APD Police Chief Art Acevedo addresses the media around 2:20 a.m. Thursday. Photo by Shelby Tauber / Daily Texan Staff. 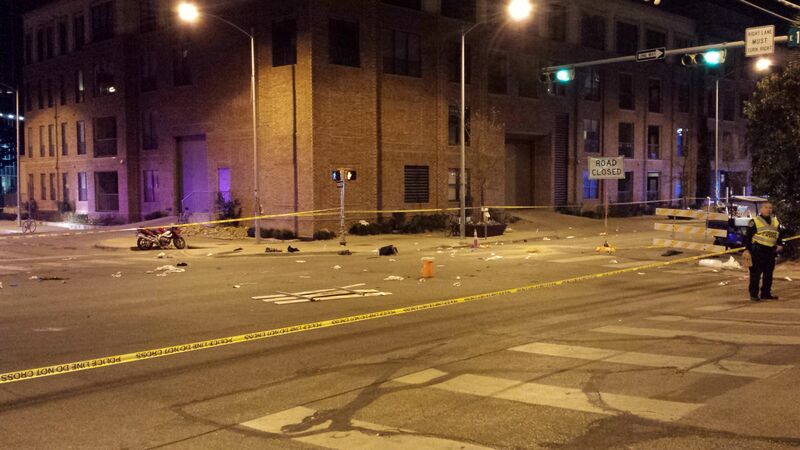 Acevedo said the driver drove through police-patrolled barricades to speed through Red River Street. Acevedo said the chase ended after the driver crashed at the northwest corner of 11th and Red River streets. Mike Benavides, Travis County Emergency Medical Services spokesman, said EMS worked with 25 patients, including five who were in critical condition. Benavides said those five people had been transported off the scene within 15 minutes. Benavides said Travis County EMS were prepared and had resources dedicated to SXSW patrol. "This traffic management plan is a plan that has worked for years," Benavides said. The area between the I-35 access road and Neches Street, and stretching from 10th to 11th Street, will be closed for most of Thursday. Acevedo said the incident was unlike anything he had seen before as police chief. “Nothing like this has happened at SXSW in the seven years [I’ve] been chief officer,” Acevedo said. Computer science senior Calvin Lau was lined up at The Mohawk to watch rapper Tyler the Creator perform. Lau saw the police cars and witnessed some of the aftermath of the incident. "It really just came out of left field for me," Lau said. "I didn't hear of anything like this happening before. I don't think anybody saw that coming." Correction: An earlier version of this story misstated the nationality of the man who died in the incident. The man is from the Netherlands. Justin Atkinson, Lauren L'Amie, Jordan Rudner, Shabab Siddiqui and Hannah Smothers contributed to this report.